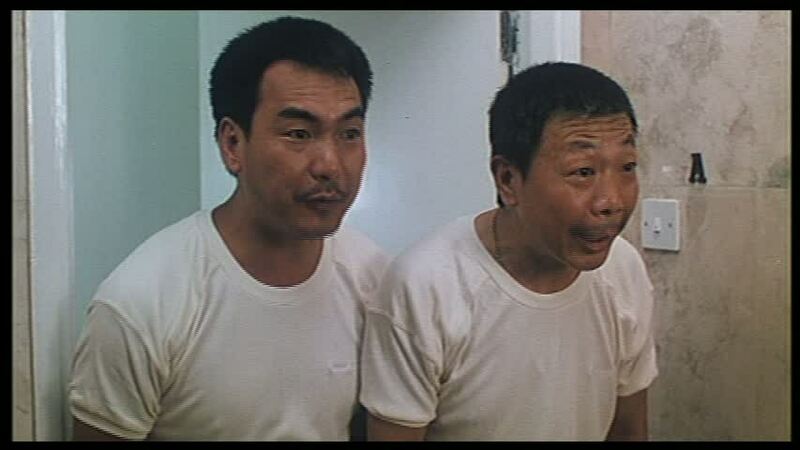 This 1988 comedy opens with Cherie Chung and Jacky Cheung having a romantic moment in bed only to get interrupted by a neighbor (Lowell Lo) who wants the couple to watch the guy's baby. Couples, Couples, Couples is a largely broad comedy about the vagaries of romance and babymaking. As neighbor Pao Niu argues with his hot wife (Sally Kwok), John (Jacky Cheung) offers to take care of the baby so the man agrees and Mary (Cherie Chung) seems to like the baby too. Meanwhile, Mary's sister, Daphne (Elaine Kam), is worried that her husband (Melvin Wong) is cheating on her. You know, my first criticism of Couples, Couples, Couples is going to involve Jacky Cheung. I know he's a legend but I've always had a hard time taking him seriously -- hell, just tolerating him -- as an actor. He seems to be unnecessarily overdoing it frequently. And his work here is no different. Jacky Cheung hamming it up as a horny guy living with Cherie Chung is just not a pleasant thing. So when the neighbors take back the kid, Mary and John discuss having a baby: Mary wants to be a mother and selfish John suddenly doesn't want his own, despite liking the baby when it was in the apartment. Couples, Couples, Couples quickly descends into one of those "let's have a baby" comedies, full of "getting pregnant" hijinks. I hate those films. So did I hate Couples, Couples, Couples? Not entirely as Cherie Chung is pleasant here and at the peak of her best era. Elaine Kam, as usual, is effective as the sister. So Melvin Wong thinks that the woman he cheated on Elaine Kam with gave him AIDS. There's an AIDS scare subplot that is shoved into the film which seems a bit over-the-top even for 1988. So Mary moves in with her now single sister and that provides the viewer with the best scene in the film. As the ladies struggle to move the furniture in, neighbors Wu Ma and Corey Yuen show up to help. It was a bit odd watching the Shaw legend and future director/fight choreographer play roles like this but they were quite charming here. After that, there are cases of mistaken identity, gay fear jokes, AIDS panic jokes, and situations that would have been rejected as too silly for "Three's Company". Really, apart from Cherie Chung -- and that bit with Wu Ma and Corey Yuen -- Couples, Couples, Couples is tedious stuff indeed. Still, for a guy like me with ambitions no higher than enjoying the lovely Cherie Chung at the peak of her career, even garbage like Couples, Couples, Couples is tolerable on some weird level. You can order Couples, Couples, Couples on DVD here.